The product is housed in a nifty rectangular bottle which is very travel friendly as it does not take up a lot of space in your bag! Also, you need to shake the bottle up as this is a water-based foundation and you will end up with runny gunk should you not shake the bottle properly! One thing to note for you ladies with pink undertones: The yellow undertones of this foundation is quite prominent! I was astonished at how yellow the foundation looked when the SA squeezed it out of the spout but for some reason the yellowness of this foundation works for my skin. As this is a water-based foundation, you need to work fast with this as it dries pretty quick! I only noticed this when I was taking swatch photos for this post. :s I left the above swatch on my arm for about 5 minutes as I was fumbling to get better lighting for the photo and it took me ages to blend this out! The main thing I adore about this foundation is that it doesn’t sit on your skin! I just use my fingers to spread the foundation over my nose / chin area and it just disappears into my skin as though I haven’t applied any foundation! This does not dry to a matte / dewy finish but just leaves you looking so natural and fresh! The SA mentioned you do not need to use a finishing powder with this product but I still do as I wouldn’t risk having my foundation melting off and leaving me with unsightly streaks on my face! Coverage is about sheer-medium for this product and although it can be buildable, I advise against you layering this foundation on your skin as firstly, this is a pricey product ( £30-ish ) and secondly, there’s always concealer! Yes, my dears… Yet another HG product for me! Do you have any good foundations to recommend? I currently only use Bourjois and Chanel but would love to try other brands! =) Do let me know if you have a HG foundation you can’t live without! 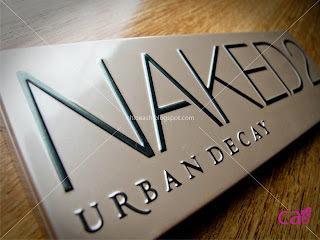 Win a Naked 2 palette!